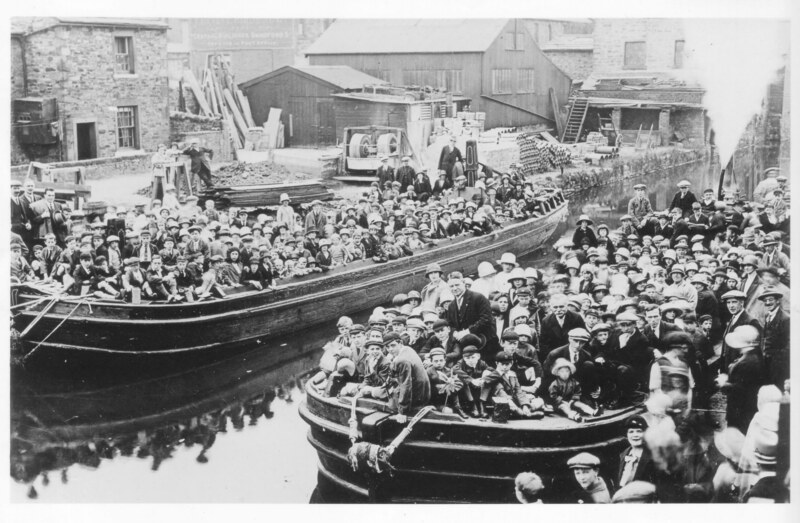 Rechabites boat trip, Bowers Wharf, off Sackville Street. My Granddad is on the boat to the right. Front right with my Dad in front of him sat with his legs stretched out and a pale hat on. Granddad has the obligatory flat cap on. He was a paid up member of the Rechabites. This is beside what is now known as Bowers Wharf, I recognise the building on the left in the background, as it was my office for twenty years. The original name for the wharf was Bowers Yard, named after Joshua Bower, of Hopewell House, Hunslet, Leeds. Bower was a coal merchant and bought the yard in 1863.